The lesson from this example is that the authentic mouthpieces of bullying empires do not serve as oracles of truth. For the Encyclopedia Britannica, Gandhi (when aged 63) was maliciously misjudged and roasted by a toady chronicler of the then powerful British empire in 1932. Fifteen years later, Gandhi lived to see a free India, and he was acknowledged by the Indians as the 'Father of the Indian Freedom Struggle.' Thus, Gandhi's experience with bad press does provide inspiration to Pirabhakaran (now aged 51) and his fans as well. The childish naivete of 'terrorism expert' and LTTE critic Gunaratna in reporting this Jayewardene boast (or rather, JRJ's Freudian slip in candidly comparing himself to Hitler) deserves a belated pat in the back. Even H.L.D.Mahindapala, another Sinhalese critic of the LTTE, would agree with the self-acknowledged bragging of JRJ as a Hitler pretender. As long as he was in power from 1977 to 1988, JRJ never permitted Mahindapala to return and work in Sri Lanka, since the latter had rubbed JRJ the wrong way, when JRJ was making his moves to capture the reins of the UNP in the early 1970s. “ ‘Mr. Prabhakaran, the Tamils hail you as a hero, the Sinhalas think of you as a murderer. Once you hand over your arms, will you be safe on the streets?’ I posed this question to the leader, and military commander of the Liberation Tigers of Tamil Eelam (commonly referred to by its acronym LTTE) less than twelve hours before he ordered his men to lay down their arms…. As all know, Pirabhakaran did lay down the rules of the game, and has played the game determinedly with one goal in mind. The Hitler-pretenders among the Colombo ruling clan, as well as the Chanakya-avatars in New Delhi, have tried their best demolish the LTTE in many devious ways. But the LTTE has survived for 30 years. Among the many books which have appeared on the deeds of LTTE, M.R.Narayan Swamy’s ‘Tigers of Lanka; From Boys to Guerrillas’ (2nd edition, 1996) which - while not totally accurate or definitive - is required reading for Tamils and non-Tamils. I provide three excerpts from this Narayan Swamy book, for years 1976, 1986 and 1996, which succinctly show the growth phases of the LTTE. “Prabhakaran founded the LTTE on May 5, 1976”. (p.31). “ Prabhakaran also made it clear that he continued to be in India only because M.G.Ramachandran (MGR) and not the Central Government. Those who talked to him returned with the impression that Prabhakaran was confident about the LTTE’s ability to take on the Sri Lankan government on its own, India or no India.” (p.201). “ One should not underestimate the LTTE’s capacity and capability to bounce back. The Tigers have displayed exceptional resilience as a fighting force. If the past is any indication, the Tigers will certainly avenge the defeat in Jaffna, come what may. Just what form this will take is difficult to guess.” (p.346). The path the LTTE had faced, during the past 30 years, to reach success was not strewn with a bed of roses. Also, the LTTE was not born in a vacuum. Its birth and growth was influenced by the political and military enviroment then prevailing in Sri Lanka and neighboring India. One definition for an entity is, “Something existing objectively or in the mind.” First, the LTTE was an entity in the mind of one courageous young Tamil, who thought differently. Then, it came to exist objectively, from May 5, 1976. Because of the LTTE’s existence as an entity, it also generated other entitites. Some of these entities were phantoms created by the LTTE’s adversaries (in Colombo and Chennai), such as the nearly 25 marginal Tamil militant groups which “existed” in the 1980s. But some other entities were real and short-lived such as the Indian Peace Keeping Force (IPKF) and the Tamil National Army (TNA). Even the LTTE’s ill-fated political wing, People’s Front of the Liberation Tigers (PFLT), was a short-lived entity. As a chronicler of Tamil affairs, I have assembled the abbreviations of over 110 entities, known by acronyms or abbreviations, which were instrumental in multiple dimensions for the birth, growth and current reach of the LTTE. Wherever feasible or when definitive information is available, I have inserted the year of origin/ year of first notice/ year of commencement of operation in Eelam and/or final year of existence for notable entities. Dates, however, sometimes lose relevance, since political as well as military entities can morph into new formations as per the exigencies and whims of the persons involved. A good example is the history of the LTTE’s primary adversary – the Sri Lankan Army (SLA). Its historical evolution follows the time-line of CRR (1796) to CLIV (1881) to CDF (1910) to RCA (1949) and finally SLA. Similarly the leading political party of the Tamils have changed its initials from FP (1949) to TUF (1972) to TULF (1976) to TNA (2001). The list is assembled in alphabetical order, and - as of now - is not an exhaustive one. ACTC – All Ceylon Tamil Congress (1944), founded by G.G.Ponnambalam who remained its leader until his death in 1977; then the leadership was held by his son G.G. (Kumar) Ponnambalam Jr. until his assassination in 2000. AIADMK – All India Anna Dravida Munnetra Kazhagam (1972), established by M.G.Ramachandran who remained its leader until his death in 1987; originally a splinter group of the DMK. Jayalalitha captured the leadership reins in 1989 and remains the leader of this party. AK 47 – Automatic Kalashnikova 47 submachine gun, the 'talking' symbol of Tamil rebellion. APC – All Party Conference, Sri Lanka (1984), the 'Jayewardene ploy' for conveniently postponing the decision making process on the Sinhala-Tamil rift. CFA – Cease Fire Agreement (2002), signed between the current UNP leader Ranil Wickremasinghe and LTTE leader V.Pirabhakaran. CLIV – Ceylon Light Infantry Volunteers (1881), which was re-named into CDF. CRNVR – Ceylon Royal Naval Volunteer Reserve (1940), which morphed into the SLN. CRR – Ceylon Rifle Regiment (1796); disbanded in 1874. CWC – Ceylon Workers Congress (1947) of Saumiyamoorthi Thondaman, re-named from Ceylon Indian Congress (CIC; 1939). A reluctant partner of the TUF, whose only policy principle since 1977 has been opting for plum Cabinet appointments and patronage paraphernalia from any ruling Sinhalese party in power. DDC – District Development Councils (1981), the 'Jayewardene trap' for the parliament- trusting TULF, led by A.Amirthalingam. DJV – Deshapremi Janatha Vyaparaya, a JVP-armed front, which came into prominence following its botched attempt in August 1987 to assassinate the Cabinet members of J.R. Jayewardene, including the then President and Prime Minister. DMK – Dravida Munnetra Kazhagam (1949), founded by C.N.Annadurai who retained the leadership until his death in 1969; after which the leadership mantle has been retained by M.Karunanidhi; originally a splinter group of the Dravida Kazhagam. DPLF – Democratic People's Liberation Front, the political wing of PLOTE, of D.Siddarthan. EM – Eagle Movement, of Gnanavel. ENDLF – Eelam National Democratic Liberation Front (1987), a hotch-potch grouping created by RAW from the malcontents of PLOTE, EPRLF and TELO. ENLF – Eelam National Liberation Front (1985-1986), a short-lived union of the LTTE, EROS, TELO and EPRLF. Feeling the tentacles of Indian manipulation, the LTTE wiggled out of this union promptly. EPDP – Eelam Peoples Democratic Party (1987) of Douglas Devananda; a splinter group of EPRLF. A one-person band, surviving as an embedded Tamil appendage of the SLA and a client 'political party' of the Defense Ministry. EPRLF – Eelam People's Revolutionary Liberation Front (1980) of K.Padmanabha and V.Perumal; a splinter group of EROS. Following the decimation of TELO, India's underground agencies worked overtime to make EPRLF dance to their tunes. As Taraki noted, "The EPRLF was much better armed and had six times more trained cadre than the Tigers when it was decimated in November 1986." By opting to be an embedded group to the IPKF operations, EPRLF lost whatever remaining credit they had as a military force by 1990. EROS – Eelam Revolutionary Organisation of Students (1975) of Eliathamby Ratnasabapathi, V.Balakumar, Shankar Raji and Bala Nadaraja Iyer aka Sinna Bala. ETOM – Eela Thamilar Ottrumai Munnani (1960), of C.Suntheralingam; a one-person band, which became a minor constituent of the TUF. FP – Federal Party (1949); same as ITAK. HSZ – High Security Zones, the exact area of which is constantly in flux. In the Jaffna peninsula, at present the HSZ nominally covers over 160 sq.kms or approximately 18 percent of Jaffna's ~880 sq.km land. Nearly 40,000 SLA troops are stationed, for guarding the only available airport, in Palali, and the KKS port. IB – Intelligence Bureau, India; India's domestic intelligence agency. IFTA – Ilankai Freedom Tamil Army (1984) of E.Saravanabavanandan. IPKF – Indian Peace Keeping Force (1987-1990), also receives the derisive tag, 'Indian People Killing Force,' from the Eelam Tamils. ISGA – Interim Self Governing Authority proposal (2003), a proposal with 23 clauses presented by the LTTE on behalf of the Tamil people for an agreement to establish a self-governing authority in the North-East region of Sri Lanka and to "bring lasting peace to all persons of the island of Sri Lanka." This remains as a non-starter due to political chicanery and the lack of foresight shown by Colombo politicians. ISI – Inter Services Intelligence (1950s), of Pakistan, a counterpart of India's RAW. Since 1982, the ISI has functioned as a patron of the SLA and its appendages in multiple roles, about which the Muslim ethnic politicians have remained tactically silent. 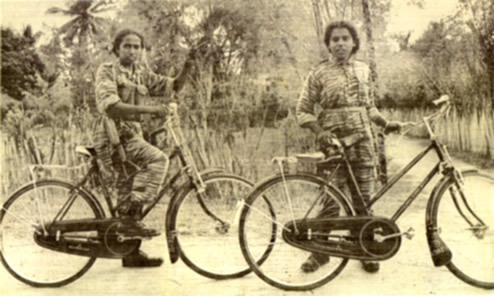 ITAK – Ilankai Tamil Arasu Katchi (1949), of S.J.V.Chelvanayakam, C.Vanniasingham, V.Navaratnam, E.M.V.Naganathan and A.Amirthalingam; originally a splinter group of the ACTC; same as FP. JHU – Jathika Hela Urumaya (2004) – National Heritage Party, a Sinhala-Buddhist monks' pressure group, which gained parliamentary representation with the election of 9 saffron-robed politicians from the Sinhalese electorates. JOC – Joint Operations Command (1984), a single General heading a special military unit, having total control over all combat troops of the SLA, SLAF, SLN and Sri Lankan Police, for executing operations against the LTTE. The JOC's powers were clipped by a paranoid President Premadasa in April 1992. JOSSOP – Joint Services Special Operations Command (1983), established to co-ordinate 'anti-terrorist' activities in Vavuniya, Mannar, Mullaitivu and Trincomalee districts. JSS – Jatika Sevaka Sangamaya (the UNP's trade union federation) whose goons brutalized Tamils and devastated Tamil private, public and business properties in 1981 and 1983. The patron of JSS was the then Cabinet minister and Sinhala chauvinist Cyril Mathew. JVP – Janatha Vimukti Peramuna (1966), of Rohana Wijeweera, which introduced the 'terrorism' word into the political lexicon of the island in April 1971. KKS – Kankesanthurai; see, HSZ. KMS – Keenie Meenie Services (1977), the British mercenary group contracted by J.R.Jayewardene and Lalith Athulathmudali (1984-87) to sniff the then budding Tamil militant movements. As per unverified web-culled information, the name Keenie Meenie is thought to be Swahili for the movement of a snake through the grass, or Arabic for covert operation. In the early 1990s, KMS was absorbed by Saladin Security. LRRP – Long Range Reconnaissance Patrol, the secret arm of the SLA's Directorate of Military Intelligence, whose primary operation is to penetrate LTTE territory and assassinate top ranking LTTE members. The LRRP's victims include Col.Shankar, Lt.Col. Gangai Amaran and Lt.Col. Nizam. Handlers and informants to the LRRP have been tackled vigorously in retaliation. NEPG – North East Provincial Government (1988-1990), a politial balloon perpetrated by India, which burst with a whimper. NLFTE – National Liberation Front of Tamil Eelam, which according to Taraki, was a small but influential Maoist group that was based largely in Jaffna, which "drove down the road to perdition by splitting hairs over the question of whether it should first build an armed wing or a mass political movement." NSZ – Naval Surveillance Zone (1984) of the SLN. OFERR – Organisation for Eelam Refugee Rehabilitation (1984), of S.C.Chandrahasan. PFLT – People's Front of Liberation Tigers (1989), now defunct political party of the LTTE. PLA – People's Liberation Army, the military wing of EPRLF, whose fumbling 'General' was Douglas Devananda. The only record (ignominious, at that) of the PLA was the 1984 kidnapping of American couple Stanley Allen and his wife, Mary Allen from Columbus, Ohio, in Jaffna. See also, EPDP. PLFT – People's Liberation Front of Tamil Eelam, a splinter group of NLFTE. PLOTE - People's Liberation Organisation of Tamil Eelam (1980) of Uma Maheswaran. As per the evaluation of its one-time member and journalist Taraki, "PLOTE had six thousand fighters trained in India and about twelve thousand trained in its military camps in the Northeast. Yet in September 1986, the organisation's local commanders were compelled to announce that they were ceasing all their military activities in the Northeast to avoid bloodshed." PTA – Prevention of Terrorism Act (1979), an utterly inept pet project of President J.R.Jayewardene to de-fang the then budding Tamil militancy, which has allowed thousands of Tamils to be arrested and incarcerated for long periods of time. P-TOMS – Post-Tsunami Operational Management Structure (2005), a memorandum of understanding signed by the Sri Lankan Government and LTTE to deliver relief and expedite rehabilitation and reconstruction for the victims of the Tsunami (Dec.26, 2004) in the six districts of Amparai, Batticaloa, Jaffna, Kilinochchi, Mullaitivu and Trincomalee. Akin to the ISGA, this proposal also turned out to be a non-starter due to the chicanery of Colombo politicians. RAW – Research and Analysis Wing, India (1968); the undercover arm of Indian diplomacy, which has been involved in hanky-panky games with Eelam Tamil nationalism since the early 1980s. RCA – Royal Ceylon Army (1949), which morphed into the SLA. RCyAF – Royal Ceylon Air Force (1949), morphed into the SLAF. SAAG – South Asia Analysis Group. A website in India (with contributors who have had past affiliations with RAW, such as B.Raman and Col.R. Hariharan) which frequently posts anti-LTTE analyses from incomplete material gathered from secondary sources. SATP – South Asia Terrorism Portal, the website of the Institute for Conflict Management (1997), New Delhi. This organ of an Indian law enforcement officer, K.P.S.Gill routinely posts malicious and erroneous anti-LTTE propaganda as facts. SAS – Special Air Service (1941, disbanded in 1945 and later revived) of the British Army's paratrooper and commando arm operating beyond the boundaries of Britain, for sabotage, infiltration and assassination. SAS was contracted by the UNP Minister of National Defense, Lalith Athulathmudali, in 1984-85 to train the SLA cadres in combat. See also, KMS. SLA – Sri Lanka Army, a corrupt and inept entity always mislead by arm-chair Commander in Chiefs and their glib-talking military generals who have more talents for propaganda blitzes than for combat. In 2002, the official cadre strength was 118,000. SLAF – Sri Lanka Air Force. In 2002, the official cadre strength was 19,300. SLN – Sri Lanka Navy. In 2003, the official cadre strength was 20,600. SLFP – Sri Lanka Freedom Party (1951), founded by Solomon West R.D. Bandaranaike, who was its leader until his assassination in 1959; originally a splinter group of the UNP. Subsequent leaders who contributed to the LTTE's origin and expansion were Bandaranaike's widow, Sirimavo Bandaranaike, and her daughter, Chandrika Kumaratunga. SLMC – Sri Lanka Muslim Congress (1981), founded by M.H.M.Ashraff, who remained its leader until his death in 2000. This Eastern front regional party then splintered into two factions, one led by the widow of Ashraff and the other by Rauf Hakeem. SLMM – Sri Lankan Monitoring Mission (2002), established in accordance to the CFA (2002), consisting of 56 personnel – as of March 9, 2006 – from five Nordic countries: Norway (18), Sweden (14), Finland (11), Denmark (8) and Iceland (5). Apart from its headquarters in Colombo and a liaison office in Kilinochchi, the SLMM has six district offices in Jaffna, Mannar, Vavuniya, Trincomalee, Batticaloa and Amparai. STF – Special Task Force, Sri Lanka (1982), the notorious militarized police of the Sri Lankan security forces manned by Sinhalese and Muslim ethnics, which received ideological input and training support from Pakistan's General Zia ul Haq. SU – Sihala Urumaya (2001), a Buddhist fundamentalist fringe group known for spewing venom on the LTTE and Tamils, which transformed into the JHU. See, JHU. 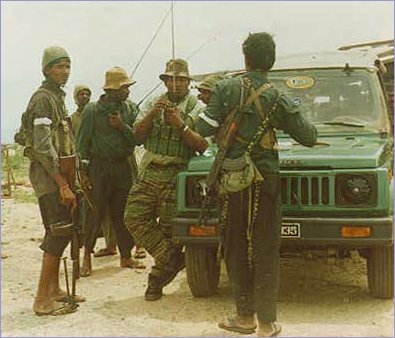 TEA – Tamil Eelam Army (1983), of 'Panagoda' Maheswaran. Now defunct one-person band which made a few crackles in the 1980s. TELA – Tamil Eelam Liberation Army (1982) of 'Oberoi' Thevan; a splinter group of TELO. Following the assassination of Thevan in 1983, TELA was absorbed by PLOTE. TELC – Tamil Eelam Liberation Cobras (1983), a short-lived Batticaloa-based group. As per Taraki, "It was widely known as the Cobra Army (Naaha Padai). It did little except call for hartals and send out pre-recorded warnings to those whom it considered traitors. The warnings ended with the hiss of a snake." TELE – Tamil Eelam Liberation Extremists, which Taraki identified as "led by a crackpot who loved to call himself 'TELE Jegan.' He was shot dead when he began to hit the limelight with a few daredevil antics." TELF – Tamil Eelam Liberation Front (1982), of S.C.Chandrahasan, M.K.Eelaventhan, journalist Kovai Mahesan and Dr.S.A. Tharmalingam; a splinter group of the TULF. TELO – Tamil Eelam Liberation Organisation (1973), of Thangathurai and Kuttimani (until 1983), and Sri Sabaratnam (until 1986). In Taraki's words, "TELO had the largest stock of weapons of all the armed groups in the Northeast when the LTTE wiped it out in the course of a few days in April 1986. TELO had eight times more fighters than the LTTE. It [also] had India's full backing." TERO – Tamil Eelam Revolutionary Organisation, of Sudan Ramesh; a splinter group of TELO. TERPLA – Tamil Eelam Revolutionary People's Liberation Army, of Thangarasa. TESO – Tamil Eelam Supporters Organisation, convened by the DMK leader M.Karunanidhi in 1986. A show-case conference was held on May 4, 1986 in Madurai, in which some leading Indian politicians (A.B.Vajpayee, H.N.Bahuguna, N.T. Rama Rao, Upendra, and Subramanian Swamy) participated and hogged the media space. TFAII – Task Force for Anti Illicit Immigration (1952), which propagated the racist taunt in the government mass-media, of VVT as the 'smuggler's capital' of the island; disbanded in 1981. TIC – Tamil Information Centre (1983), the brain-child of attorney K. Kanthasamy and journalist S. Sivanayagam, and located in Madras (Chennai). An organization of the same name was also located in London for a number of years subsequently under different leadership. TLO – Tamil Liberation Organisation (1969), the progenitor of TELO. TNA – Tamil National Alliance (2001), the lead political party of Eelam Tamils comprising ITAK, ACTC, TELO and EPRLF (Suresh faction), led by R.Sampanthan. See also TULF. TNA – Tamil National Army (1989-1990), the ill-conceived brain-child of India's policy mandarins and intelligence hands, which could survive only on artificial respiration. TNT – Tamil New Tigers (1972-1976); renamed the LTTE. TRRO – Tamil Refugees Rehabilitation Organisation (1977), the livewire of which was trade unionist K.C. Nithyanantha. TS – Three Stars (interpreted as representing the three ethnic groups in Sri Lanka), an embedded para-military grouping which received news mention during the IPKF operations (1987-89). see ENDLF. TSK – Tamilar Suya-Aadchi Kazhakam (1969), of V. Navaratnam; a splinter group of ITAK. TSL – Tamil Students League [Tamil Manavar Peravai] (1970), founded by Ponnuthurai Satyaseelan. See also, TYL. TUF – Tamil United Front (1972-1976), formed with the elderly triumvirate leadership (S.J.V.Chelvanayakam, G.G.Ponnambalam and S.Thondaman). ; re-named TULF. TULF – Tamil United Liberation Front (1976). The deaths of indigenous Tamil leaders Ponnambalam (in Feb.1977) and Chelvanayakam (in April 1977), combined with Indian-Tamil leader Thondaman's aspiration for a Cabinet Minister position, saw the leadership batton passing into the hands of the next generation of triumvirate leadership of A. Amirthalingam, M. Sivasithamparam and R. Sampanthan. Sivasithamparam served as the nominal head until his death in 2002. Since early 2004, V.Anandasangaree claims the current leadership of a rump TULF, though discredited by the Tamil voters who have moved their allegiance to the TNA (2001). TYL – Tamil Youth League [Tamil Ilaignar Peravai] (1973), the progenitor of Eelam Tamil militancy. UDI – Unilateral Declaration of Independence (1990), a farcical act enacted by V. Perumal of the EPRLF as head of the NEPG, who then fled from Trincomalee. UNP – United National Party (1947), founded by Don Stephen Senanayake and his then coterie (including Solomon West R.D. Bandaranaike) to share the spoils of political power of newly independent Ceylon. UNP leaders who contributed to the expansion of the LTTE have been J.R. Jayewardene, Lalith Athulathmudali, R. Premadasa, D.B. Wijetunga and Gamini Dissanayake. UTHR (J) – University Teachers for Human Rights [Jaffna] (1988), set up on the initiatives of Rajani Thiranagama, Rajan Hoole and their coterie. VVT – Valvettithurai (the native town of Pirabhakaran), which bore the brunt of the TFAII activities in the 1950s and 1960s, and in turn became a fertile ground for Eelam militancy in the 1970s. Condemned to six years' simple imprisonment, he was released in January 1924, after an operation in gaol for appendicitis, and the rest of his sentence was unconditionally remitted. He came back to a party which had chosen other leaders, and was soon to reverse his policy of boycotting the administration. Esteemed and consulted though he continued to be by his old followers, he was no longer a power to sway the masses; at the end of 1925 he announced his intentions of retiring from the world for a year; and his most recent incursions into politics have been ineffective. The nationalist movement was switched on to lines more familiar to western constitutional usage…"
The lesson from this example is that the authentic mouthpieces of bullying empires do not serve as oracles of truth. For the Encyclopedia Britannica, Gandhi (when aged 63) was maliciously misjudged and roasted by a toady chronicler of the then powerful British empire in 1932. Fifteen years later, Gandhi lived to see a free India, and he was acknowledged by the Indians as the 'Father of Indian Freedom Struggle.' Thus, Gandhi's experience with bad press does provide inspiration to Pirabhakaran(now aged 51) and his fans as well. Similarly let me present two examples of premature requiems, which were paraded for Pirabhakaran. "The Tamil Tigers of Sri Lanka are facing extinction. Like the great beasts they named themselves after, they were fighting tooth and claw this week against the Indian soldiers sent to disarm them, but it was a losing fight. They were outnumbered, outgunned, running out of supplies and, with the Indians blocking every exit, had no place to retreat to. Guerrillas are no match for orthodox battalions in a pitched battle, the sort that was taking place in the Tigers stronghold in Jaffna. By Thursday it was estimated that may be 300 Tigers had been killed, for the death of 57 Indians. Never before in Sri Lanka's civil war had the Liberation Tigers of Tamil Eelam, to give the guerrillas their formal name, taken such punishment." "…From a tactical point of view, Prabakaran's actions were baffling. The peace plan had promised the Tamils local rule in the regions where they predominate. The rebel leader had extracted a further concession that would have allowed his group to control the interim administration. Why had he sacrificed such tangible political gains and provoked a military confrontation that could only lead to his destruction? A widely held view was that Prabakaran had 'lost control' of himself, as one Sri Lankan official put it, following his comrades' group suicide. Others speculated that, on the contrary, he had told his men to take cyanide in order to make martyrs of them and spark a general revolt among the Tamil population. According to this scenario, he had hoped the resulting unrest would topple the Jayewardene government and perhaps pave the way for full Tamil independence. In any case, Prabakaran apparently had not expected his former Indian benefactors to move against him. That was a serious miscalculation. 'He thought he could push us around and get away with anything', said an Indian diplomat…"
In all probabilities, this un-named Indian diplomat was none other than J.N. Dixit, the then Indian ambassador in Colombo. As sound-bites for the political mandarins of New Delhi and Colombo, these reports from the ground, filed by journalists with zero aptitude for military strategy and tactics, may have served a short-term purpose. But for portraying the historical validity of the outcome in which the LTTE emerged as the victor against the Indian army, these make hilarious reading now. To reiterate, it is to the credit of LTTE's tenacity that 'Wizard Time,' the ever-scrupulous chronicler of history, has demolished the arrant nonsense of the blind-sighted first drafts of history which appeared in the Economist and Time magazines in 1987. Let's toast to the long life of the LTTE. Blodgett, B.: Sri Lanka's Military – The Search for a Mission, 1949-2004. San Diego, Aventine Press, 2004. Encyclopedia Britannica, 14th ed., vol.10, 1932, p.15. Gunaratna, R.: War & Peace in Sri Lanka. 3rd ed., Kandy, Institute of Fundamental Studies, 1990. Gunaratna, R.: Indian Intervention in Sri Lanka – The role of India's Intelligence Services. Colombo, South Asian Network on Conflict Research, 1993. Narayan Swamy, M.R. : Tigers of Lanka – From Boys to Guerrillas. 2nd ed., Colombo, Vijitha Yapa Bookshop, 1996. Taraki: 'Tigers dominate decades of Tamil militancy.' Colombo Daily Mirror, Aug.18, 2004.